The response to my birthday party was quite overwhelming - almost 250 people have confirmed that they're coming. I was expecting only 100! Because of this I'm forced to make some changes. In an effort to save some money promote responsible drinking, I'm gonna have to limit all invited guests to one alcoholic beverage per person on my tab. Rotorua was great for doing something different, like zorbing, but there really wasn't anything blog-worthy to mention. Excuse me, aren't you supposed to paddle when you're inside the river? 1. 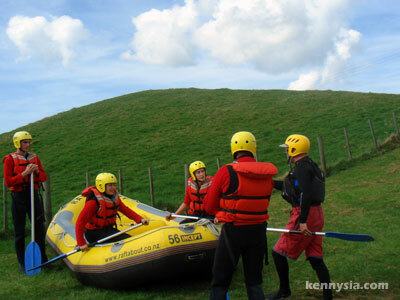 Falling off a two-storey high waterfall in an inflatable boat with a bunch of Scottish guys. 2. 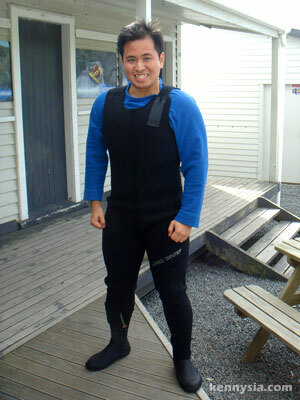 Me getting into the most ridiculous-looking wet suit EVER. WTF. That thing is so bloody tight, my balls had trouble breathing. I had to secretly stick a straw into my suit in case the little fella died due to lack of oxygen. 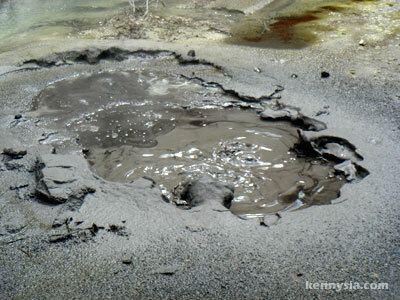 I could tell you that I visited some natural geothermal wonders, but honestly there wasn't anything much worth blogging about a place with a couple of mud pools and some funky-coloured ponds. 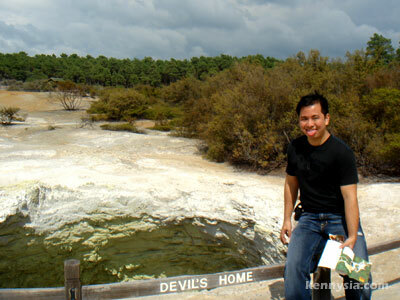 Find a hole in the ground, give it some evil-sounding name and call it a tourist destination. What lah, I can also do that. From Rotorua, we drove down to the scenic town of Taupo. Along the way we stopped by for lunch at New Zealand's only freshwater prawn farm and paid NZD$29.50 / RM74 for 8 pieces of prawn of a species imported from Malaysia. Siao. 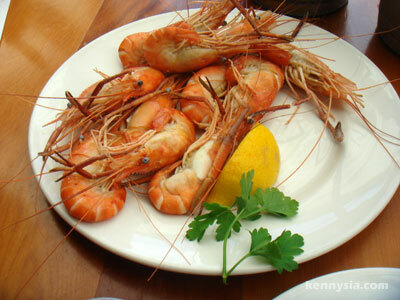 Prawns are so expensive here in New Zealand because the country does not have the warm climate necessary to breed prawns naturally. The Kiwis had to import heaps of them from Malaysia and other countries. Not far away from the prawn farm is a place I totally recommend visiting if you're around the region. The honey toast here is absolutely heavenly. Thinking about their irish cream honey fudge still makes my mouth water till this day. 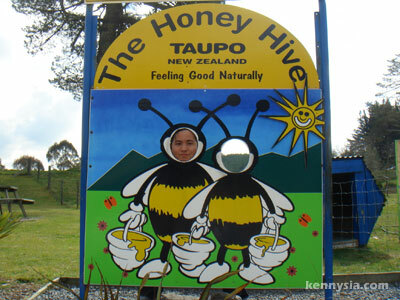 New Zealand has some of the world's best-tasting honey. So good that Amway has begun to import them and sell them for RM100 a jar. Ridiculous. We finally reached the lovely town of Taupo in the evening. The views here are breathtakingly gorgeous. 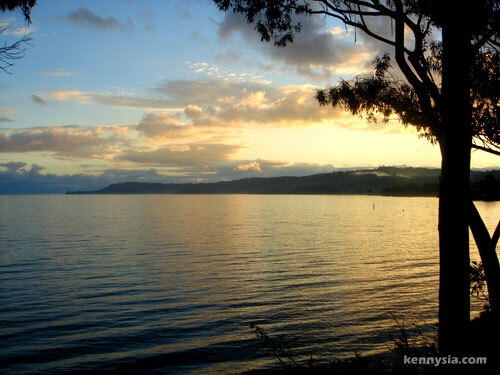 The centerpiece attraction here is Lake Taupo, a large freshwater lake approximately the size of Singapore that was created following the collapse of a super volcano thousands of years ago. 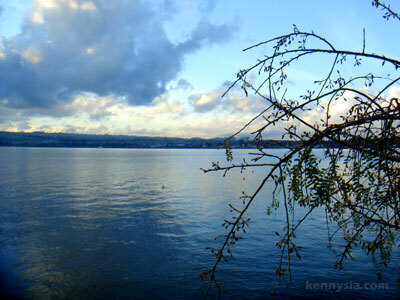 Every photo I took here is postcard quality, thanks to the panaromic views of the lake and mountains. It's no wonder this place is one of the most popular tourist destinations in New Zealand North Island. They say the further south you go from New Zealand, the better the views are. I certainly cannot argue with that. 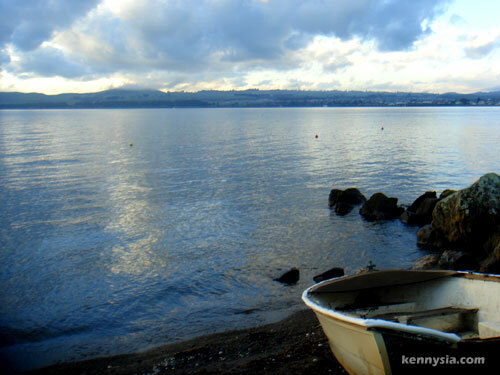 For a change, we decided to do homestay while in Taupo. 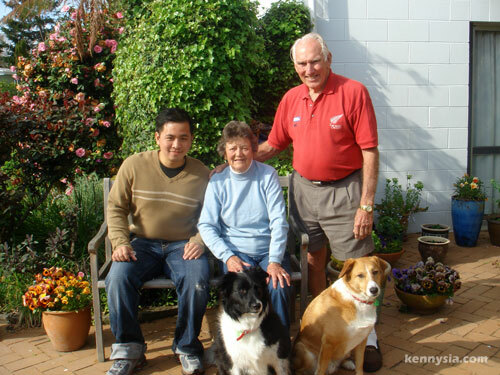 Our hosts are a 78-year-old couple who live alone with their two dogs and rent their spare rooms out to holidaymakers. It's not everyday I share the same roof with someone also on Wikipedia with me, eventhough he probably doesn't even know he's in there. 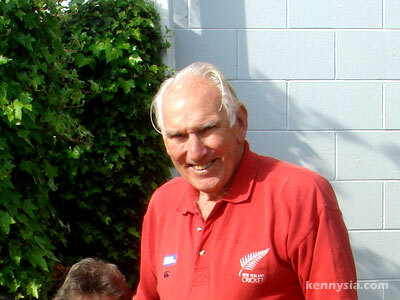 The patriach of the family John Reid is a former captain of New Zealand's cricket team, and from what I heard, is quite a legend himself. Too bad the only cricket I know is the one that makes a lot of noise in my backyard at night. I could tell our presence was a welcome break from their loneliness. Over breakfast I told the old couple that I'm working in IT. They didn't understand what "IT" means. I had to explain to them that it's "stuff to do with computers". John's eyes lit up immediately and he explained to me this nagging tech problem he's having. "I have this mobile phone that used to ring, but now it doesn't ring when people call. Because of that I haven't used it for 6 months already." It took me 2 seconds to change the phone profile from silent back to normal. When his phone rang for the first time in 6 months, John was so happy he danced to the ringtone. It's a great feeling when you can make old people laugh and dance. Staying with them was definitely one of the highlights of my trip. The old couple treated us with such warmth and hospitality. When we're about to leave, they almost forgot to ask for payment. 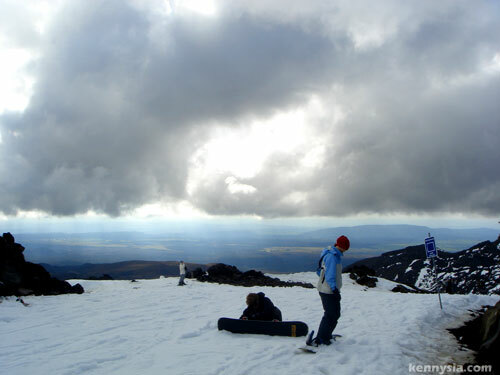 From the Reid household in Taupo, we drove a further 1.5 hours south up to the Whakapapa Snow Fields for some skiing action. 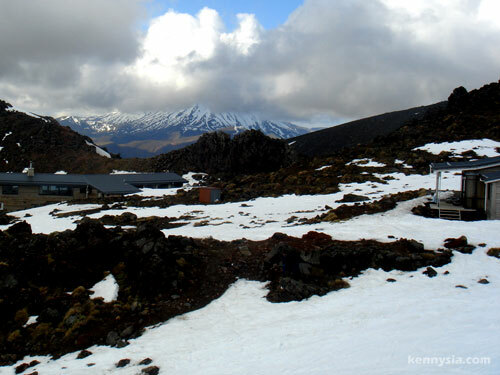 "Whakapapa" is a Maori word. In Maori, "WH-" is pronounced "F-". 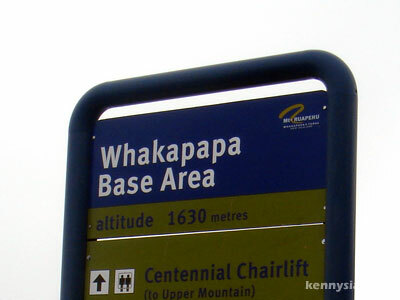 So "Whakapapa" is pronounced "Fucker Papa". Unfortunately God wasn't on our side. Winter has already ended. The snow levels at the ski fields were kinda low and protuding rocks were everywhere. Very dangerous. I skied around a bit, then decided I'd be too much of an idiot to risk breaking a bone for a moment of fun. So instead, I indulged in the safer sport of camwhoring. Then I realised I was looking damn gay. So I stopped what I was doing just drove all the way back to Hamilton, concluding our memorable, exhausting yet exhilirating NZ North Island trip. Those prawns look so bland. i miss being the 1sst post by a mile ! yes ...you do look very gay in that pic ! Next time if you happen to visit Perak, you should stop by Tanjung Tualang, dat is where they breed those kind of freshwater prawn. Selling dirt cheap there. 4th for the first time !!!!! nice scene.postcard qualty.agree.n surprise there's nobody comment on this post.i'm the 4th.usshhh...whakamama. The scenery is awesome. I really got to go there. How much did the homestay cost? And dude, that wet suit... Scary! The homestay is kinda cool. But I guess it costs you more than staying in hotel or guesthouse right? wahahahaa...... those post picture look cool and.....gay...hahahaahah jk 9 2 meet ya~! thanks again for sharing yr travel log! it's great that u can find homestay for few days - they dont advertise, do they? HI KENNY, THE PIC THAT U TOOK IS AWESOME, MAY I KNOW WHAT CAMERA U USE? TQ. HAVE A WANDERFULL & AWESOME B-DAY PARTY THIS COMEING SUNDAY, BTW U INVITE THE PRESS? HAVE A NICE DAY. dude~! i think something wrong with ur comment box lar...btw water rafting is cool...wat is the class of the rapids? 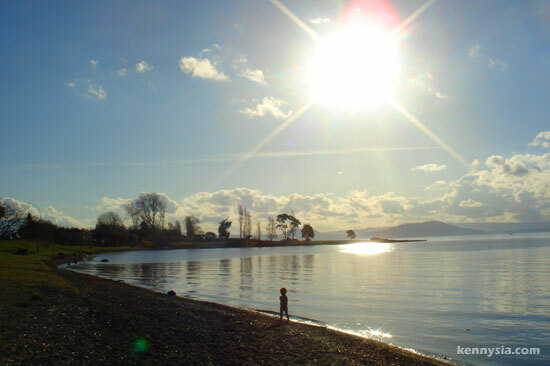 the only problem with taupo is that there ar eso many japanese people there that it is almost like going to Japan!!! but i must admit it is beautiful i am so so lucky to have been born here. if you ever make it there again on a charter boat named Chris Jolly you will taste the best trout ever on it! and catch a few while you are there. that's a great business pitch; kennysia.com postcards. not a bad idea really... you have kennysia.com the blog, and now, kennysia.com the postcard. heck if you can start selling enough, you might be able to pay for the free flow of alcoholic drinks during the most awesomest birthday party ever. Wot...lol...can't believe ,JOhn silents the mobile phone for 6 months? Very impressive for the IT person like you able to change his lifestyle. It's called "Human Technology" :) u look great! Be merry and gay...~~! jk..
Come out of the closet. YOU ARE VERY GAY!!! how much u spent for whole trip to nz? Come out of the closet. YOU ARE VERY GAY!!!! By the way, rumour has it that anti-narcotic team will raid your party this Saturday. Thanks to your own publicity. Those under age and drug junkies, BEWARE! Kenny, do you use flash in your photos? who were with you on the trip? You forgot the snorkel - just in case. u look cute in THE BEE HIVE !! lastly and not the least, u look "slimmer" in the last picture ! i dun lie, kenny ! "I'm gonna have to limit all invited guests to one alcoholic beverage per person on my tab." You traveled to so many lovely places in NZ. How long was ur vacation in NZ? enjoy ur birthday party dis weekend. "happie birthday in advance"
p.s. luv dem scenery man. I'd love to homestay there someday. Sigh, perhaps when I get lucky. snowboarding is the way to ride. 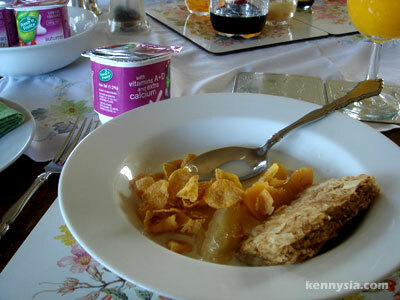 Is it a bed & breakfast package at Reid's place? Anyway, NZ's Manuka honey is famous for its medicinal purposes. Did you bring back any from your trip? 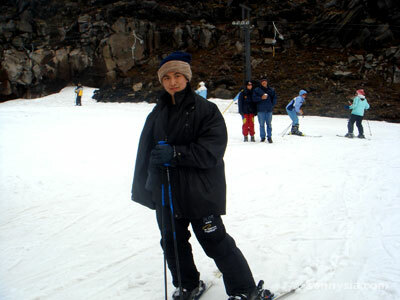 I skied in Mt Ruapehu too when I was there last time. They have a Happy Valley for kids and amateurs. I miss the place so so so much. Some of the scenes in LOTRs were filmed in that area too. 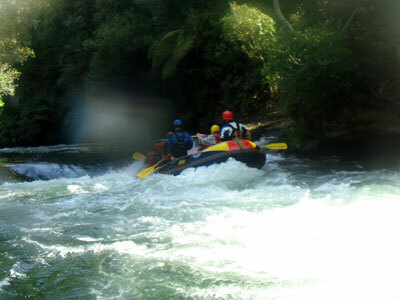 Lastly, I think Black Water Rafting is so so so much exciting than the White Water Rafting. Because you get to climb, swim, paddle in a freaking cold and dark tunnel for almost 2 friggin hours long. By the time you are out from the hole, you'll be as cold as a corpse. LOL. 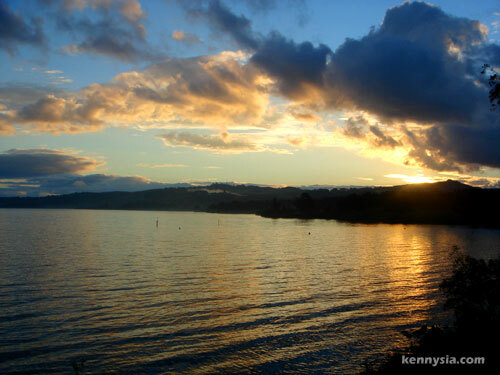 Did you visit the Maoris Village in Rotorua there? 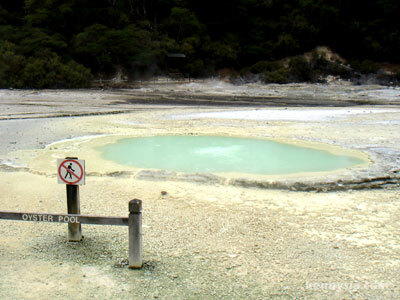 The legend has it that the Maoris live inside the hot springs area to keep themselves warm during winter time. That place still have lots of graveyards from the old times. Did you buy yourself any green stones/jades to wear on your neck for good luck and all? And yeah, I kindda enjoy the Moon Craters Walk too the last time I was in Taupo. And we ate at the same freshwater prawns restaurant too. They claimed that they rear the prawns in their backyard. I really feel robbed & cheated after dining in there. Their souvenirs are damn expensive can die. I even tasted a prawns that costed me RM42 in M'sia itself (only 2 pieces)in a restaurant called SAKURA so your prawns were considerated ok in price ..hahaha. Will visit NZ one day...for sure. 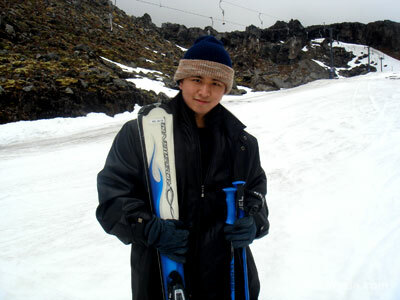 Ooh you look skinny in your skiing jacket alto it is a bit ... hahaha. uh who is the we? Love those scenic photos! :D Makes me want to take the next flight to NZ. Wah! almost couldn't recognise u in the first picture of you in jacket. I bet if you slim down, you'd be the most desired blogger. hahaha! 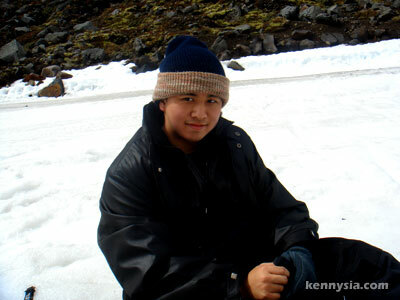 Kenny, has anyone told you that you are cute? If so, they are lying to you. loool i was looking for a mobile phone review for the LG 810 that you got & ended up here. Oh no! Another gayish post! the prawn are really expensive, especially for kuching ppl who can eat prawns easily n cheaply. hi there kenny. love your entries about your nz trip as i am thinking of visiting my aunt who's staying in auckland too. i am planning a roadtrip starting from auckland and travelling down south. the homestay looks absolutely lovely - can i have the contact of the Reids couple as it will be useful for my trip. thanks! can't wait for your bday party photos..
"Aduh warning sign. What kinda idiot would walk into a pool anyway"
i cant wait to go to new zealand! 6:01 PM, 27 November 2006 | Link | Reply jm. For a person who had travel widely, considering that he played cricket internationally, a native english speaker as well, it's intrigue that he could not figure what's wrong with his mobilephone for six month ! So out of touch with the world ? The mobilephone problem was so funny... Six months problems solved in two seconds! i think u look just good, it took me just a moment to fall in love with you! !